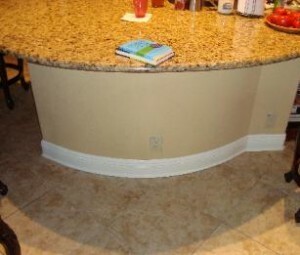 The purpose of baseboard molding is to finish in the region where the wall meets the floor. Baseboards should be chosen to work in harmony with your casings to finish and tie the room together. where the wall meets the floor. It covers the inevitable uneven edge as flooring meets the wall. As a secondary function, it protects the wall from kicks and abrasions. It can also serve as a decorative molding and in older homes baseboard was made up of elaborate and decorative molding. Today, current design trends have gone back to the elaborate baseboards of the past in conjunction with elaborate moldings. Many homeowners are choosing to install elaborate baseboards and molding as an additional way to add distinguishing features as well as adding value to their homes. For more information on Baseboards or for a Free In-Home Estimate, Contact Gloger Construction today.